I received my order from Gifted Goodies UK today. I ordered lots of hand knitted and crochet hair ties which are pretty unusual. I've actually never seen these before! If you love knitted items then you will loooove these. They're really bright and colourful too! If you have lots of hair like me then I'd advise asking for the thicker elastics as the small ones are definitely more suitable to use at the end of braids rather than holding all of your hair up. 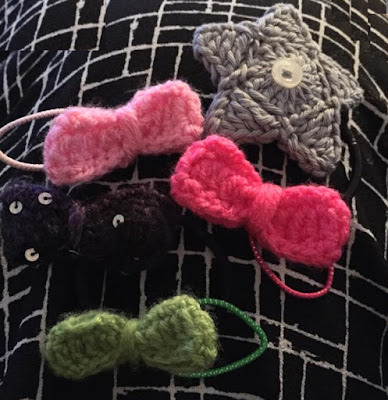 Cudos to the lovely Michelle from Gifted Goodies UK - she must put loootsss of work in to knit all these lovely little bows. They're so cute and I'll enjoy wearing them in my hair. Michelle takes custom requests too so if you want a particular colour then you should go ahead and ask her, she will be able to co-ordinate the elastic colour as well.